*Note about his chapter* Its kinda short because I am not really inspired completely and I have no idea why. Hopefully some inspiration will hit me soon so this chapter is a filler and so please bear with me. :) :) Enjoy!!!!!! Ava and Aaron both had dark curly hair like Sidney and had Carrie's eye shape and nose. They were cute and everyone who saw them smiled. Mario Lemieux had invited Sidney, Carrie and the twins over for lunch at his house. Ava and Aaron were a big hit with the Lemieux kids. Everyone was enjoying a fun time. After lunch Mario asked Sidney to come into his office because he wanted to talk to Sidney. Mrs. Lemieux, Carrie and all the kids went to the back yard and played and talked. "Sidney, how are things going with you?" asked Mario as he sat down in a chair and motioned for Sidney to sit too. Sidney sat down across from Mario and looked him in the eye. "I will be honest with you sir, its hard and exhausting. And part of me is really scared about being a father but I know that with Carrie's help, I will be fine." "You are right being a parent is scary and you never know what's going to happen next but since you have Carrie, who is an amazing lady by your side. I am sure you two will successful parents to Ava and Aaron." "Thank you sir. There is something I need to talk to you about having to do with my living arrangements." "I had a feeling you were considering moving out since you started dating Carrie" Mario said. "Yeah I have been looking at houses here in Pittsburgh and I think I have a few possibilities but I want to talk them over with Carrie now." "That's great Sidney and I hope that this means that there might be a wedding at some point soon?" inquired Mario smiling at Sidney. "I hope so sir. I actually do have a ring that I had personally made recently after we won the Stanley Cup. My mother helped me find it and I am just now working on a surprise for Carrie to ask her to marry me" explained Sidney. "If there is anything I can do for you or Carrie please feel free. After all we are family" Mario said as he got up and Sidney did the same and then turned to Mario. "Actually there is something I would like to ask you. Would it be possible if you could help me out with my surprise for Carrie?" asked Sidney. "I want to propose to her in Mellon Arena at the first practice of the new season in front of all the guys and everybody out on the ice" explained Sidney. "I think that can be arranged without any problems, Sidney" Mario said. "You know that your family should be there too, sir." "We will all be there" Mario said. "Thank you Mario and I will let you know more when I have more ideas on what I have planned" Sidney said. Sidney and Mario got up and headed outside to where Natalie, Carrie and the kids were playing and having fun. Sidney went over and sat down next to Carrie and put his arm around her. She leaned her head on his shoulder and they both looked at Ava and Aaron. The twins were lying on their backs as the Lemieux kids were talking and playing with them. "Hey Carrie" Sidney whispered into her ear. "Hey Sidney why are we whispering?" asked Carrie as she sat up. "I don't want everyone hearing our conversation right this very second" smiled Sidney. "Are you getting ready to tell a dirty joke or something?" joked Carrie. "No, I just wanted to tell you that I love you" Sidney said as he pulled her into his lap. "I love you too" Carrie said as she situated herself in Sidney's lap. They all sat there for a little while longer and then Carrie and Sidney headed home so the twins could have their regular nap time. Sidney and Carrie got the twins taken care of and then they themselves headed to the bedroom for some much needed sleep. The next several weeks Sidney was busy getting ready for training camp and his surprise for Carrie. Carrie was none the wiser about what was going on, mainly because the twins kept her very busy. no problem eh Luvsid! 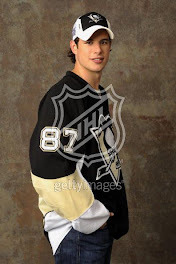 :) lol thats so cool because im french lol :) i love hearing sid talk french its soooo darn adorable! haha. once again loved the chapter!